First published in 1984, this work explores the issues surrounding the industrialisation of the Third World at the beginning of the 1980s. 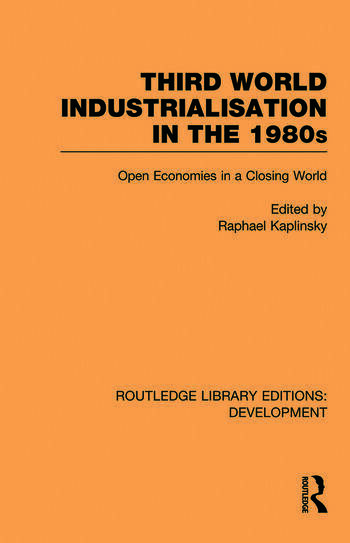 The expectation that Newly Industrialising Countries would facilitate industrial growth via an outward-orientated strategy had begun to be the combination of growing recession, growing protectionism and the diffusion of radical microelectronics-related technical change. In addition, the high indebtedness of developing countries made them increasingly dependent on assistance from the IMF and IBRD, whose policies increased the tendency towards de-industrialisation. The papers in this volume explore all of these issues and their implication for LDC industrial strategy in the 1980s. 1. Industrialisation Strategies in Less Developed Countries: Some Lessons of Historical Experience 2. Trade, Industrialisation and the Visible Hand 3. Private International Finance and Industrialisation of LDCs 4. The International Context for Industrialisation in the Coming Decade 5. Developmental States and Socialist Industrialisation in the Third World 6. Industry and Underdevelopment Re-examined.